Is your bathroom too small? Many houses have tiny bathrooms. Many people mourn the lack of space, feeling like they’re always bumping up against a counter, a curtain or a cupboard. Short of knocking out a wall, how can you make a small bathroom feel bigger? Carve out a little extra room by changing some of the fixtures. You can also use decorating tricks to create the illusion of more space. Some fixes you can do on your own. For others, you’ll need to hire a plumber. A plumbing company may not be the first place you think of when you decide to redo a home. It makes perfect sense, though, when it comes to remodeling a bathroom. Flawless plumbing is at the heart of a washroom. Simpson Plumbing can help you with any remodel job that involves pipes and plumbing. But, we’re more than plumbers. We also have talented craftspeople on staff who have skills to remodel any spot in your home. 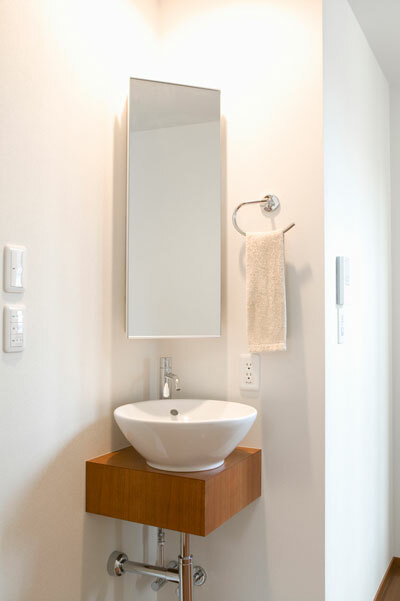 Remove the vanity: A vanity in a small bathroom takes up too much space. Choose a wall-mounted or pedestal sink instead. If you can’t do without the storage, at least consider installing a small wall-mounted vanity. You can get a vanity that’s the same width and depth as your sink. Wall-mounted cupboards create the illusion of space simply because they’re airier. Consider a new toilet: If you go with a wall-mounted sink or vanity, you might as well also install a wall-mounted toilet. Your fixtures will match, and this style toilet takes up less space. Add recessed storage: Many medicine cabinets are designed to fit into a wall. Take this theme further by adding more recessed cabinets and shelving. Have a mix of open and closed storage. Mirrored cabinet doors will make the space feel larger, and you can never have too many mirrors in a bathroom. Change the tub: If you don’t use your tub, replace it with a standalone shower stall. A curbless shower with glass doors takes up less space and looks sleek. If you like taking a bath, consider updating to a space-saving model. Tubs come in smaller sizes. A corner tub can often take up less room. A standard-size tub with glass sliding doors may not save room, but will make the bathroom seem bigger. Choose a color scheme: You’ve probably heard the advice to use a lighter color to make a room seem bigger. While that’s true, it’s more important to use a limited color palette, even if it’s in darker tones. Use a single color family for everything in the bathroom. Use that color for walls, fixtures, furniture and accessories. Add interest with one focal point, such as a lighting fixture, mirror or piece of art. Have a lighting design: Good lighting opens up corners and makes a room feel bigger. Most bathrooms have overhead lights and lights above the mirrors. Think of other places to add a wall sconce or two. Choose fixtures with a narrow profile. Since bathrooms have many shiny surfaces, place lighting to take advantage of the reflective surfaces of mirrors, glass and tile. While a large bathroom is luxurious, a small bathroom has advantages. Because a small bathroom is, well, small, high-end finishings and fixtures may be within your budget. When there’s just a little area to tile, you can go with a pricier option if you prefer. Transform a small room into one that you love. Chances are you’ll never miss the extra space, especially when it’s your turn to clean. Contact Simpson Plumbing today to get started on plans for a new bathroom.